Beegit is a flexible content production platform that helps you understand how your content team works and how it can work better. Beegit gives publishers, agencies, and other content teams access to the tools they need to do what they do best: create great content. Feel like you’re being swarmed with inefficiencies? Find your sweetspot with powerful, one-of-a-kind metrics that give you insight into the writing performance of your team. See where your content team excels, identify its weaknesses, and gain the insights you need to make decisions. Your content is your most valuable asset. Beegit ensures it’s delivered to the right places, at the right time and in the right format (Markdown) --- all while keeping it organized and secure. More and more content teams are becoming distributed content teams. They’re working remotely and on the go, and while that means a more flexible workforce, it also means managers need a way to keep everyone connected and working together. 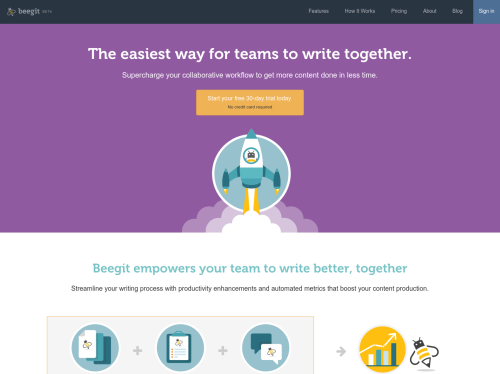 Beegit provides teams with a single, centralized platform --- a hive, if you will --- to create and collaborate on content. Watch your content get done on time, every time with simplified version control, @mentions to keep collaborators in the loop and light workflow tools to manage the whole process.